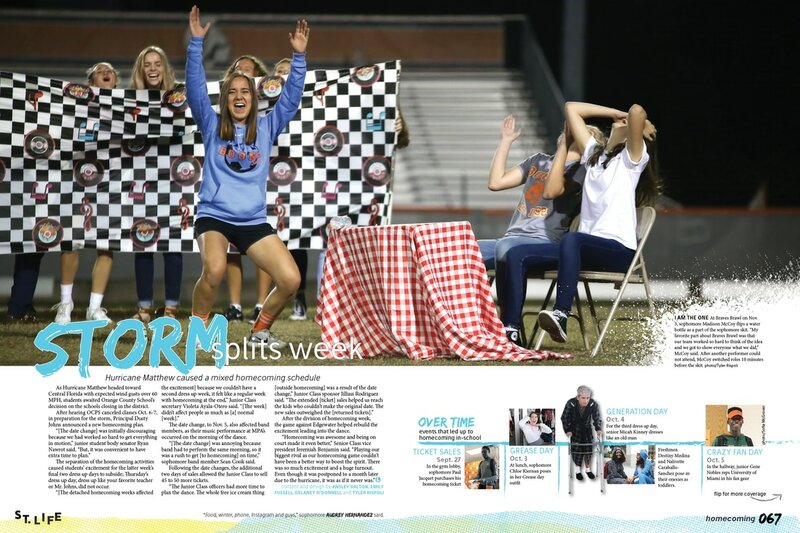 About: In past years the homecoming page featured two different pages: one for homecoming nights and one for homecoming days. This year when building the ladder we decided to do a dual page design featuring extended coverage. Designing these spreads proved more difficult than I imagined. I used a timeline across the bottom, but also used this timeline to carry the eyeline from one spread to the next. The first page features a huge dominant photo, that I took, which pulls people into all the coverage. The second spread challenged my design skills because I didn't want to make it look like a cluster of mods, but more like a standard spread. I featured a dominant on the second page and fit 36 pictures picturing more than 41 students. While challenging, I think the spreads follows basic design rules (dominant photo, eyeline and use of white space), while also being visually appealing and content heavy. About: At first I didn't realize how vital this spread would be in our Legend 2016. This In-depth design acted as the design for another In-depth on religion. I knew an In-depth featured more of a long-form writing style so when creating this spread I had one goal in mind: a huge infographic. I also wanted the background to have a purpose and set the mood for the page; this one portraying a relaxed sleepy mood. On the infographic side I wanted to use vectors, quick facts and color to appeal to the reader. We also figured what kind of high schooler doesn't know about not getting sleep, so I conducted multiple polls and interviewed students for quotes to add a student body element to the design. This page definitely presented some challenges as I had and abundance of facts from eight credible sources to fit on one side of the page, but in the end, having an infographic allowed for more visual interest and quick readability in the design. About: The dominant is an interesting attribute to this page. A designer should consider the dominant when creating a spread. This page's dominant acts as more than just a photo. I knew when designing I wanted the dominant to stand in the top left corner because of the way Katie Marshall, Legend 2016 photo editor, took the photo. I wanted the baritone to look like it was speaking the story and to bring the reader into the page. 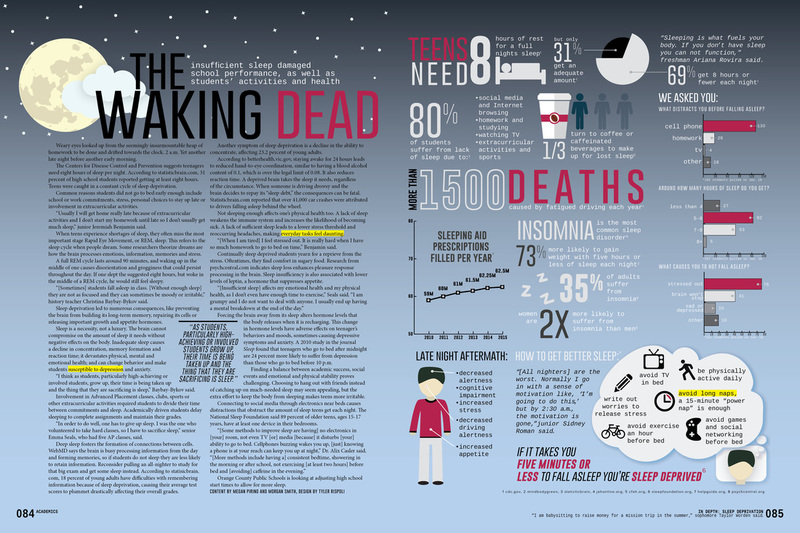 About: As a designer who loves and appreciates infographics I knew I wanted one on this spread. 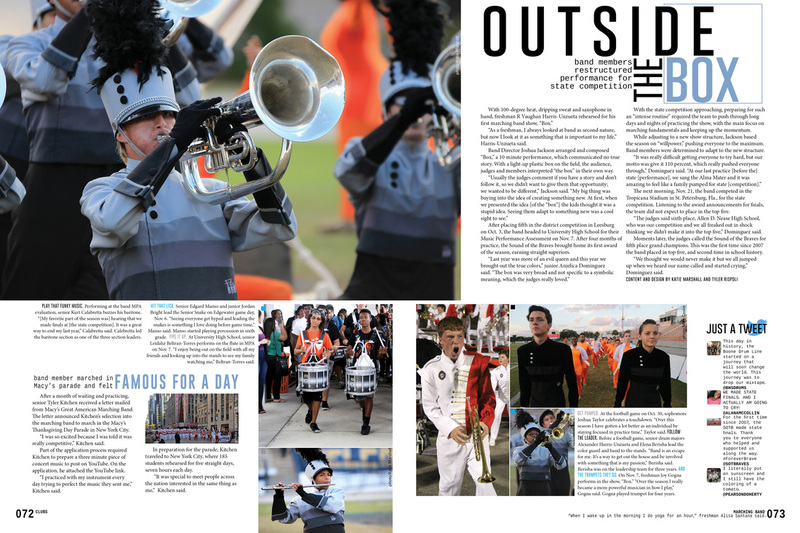 I'm a visual guy and sticking to the panoramic as the dominant element along with mods allowed this page to have visual appeal, as well as provide information about key moments from the Class of 2017 on a non-traditional way. 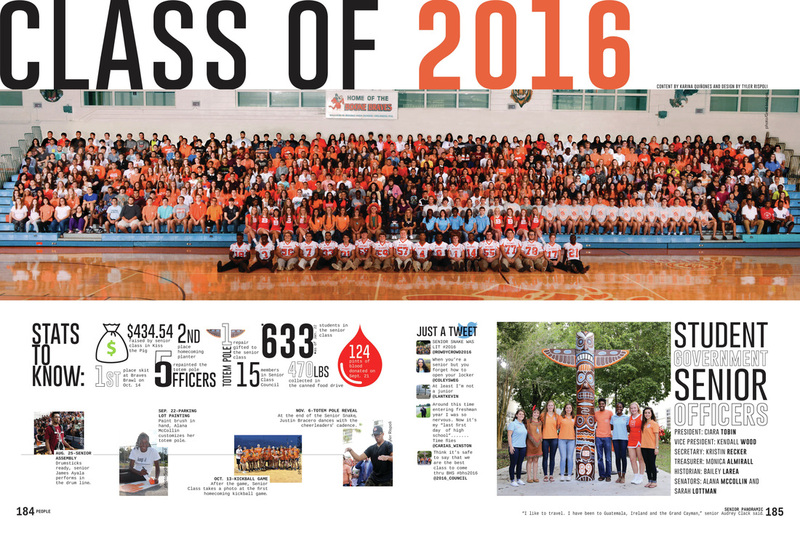 After dropping in all the mods and creating the infographic this page really came to life, highlighting key moments from the Class of 2016. About: Coming into yearbook I didn't know much about design. After learning the ropes through other editors and staffers I designed this page with less than four months of experience. The dominant photo offset this page from all the other pages in our book, with one of the hardest cutouts ever, and not your typical rectangular dominant. This killer photo made readers stop as they flipped through the book. The design also featured two modular elements I designed, "Dressed to the Max" and "Hot or Not." 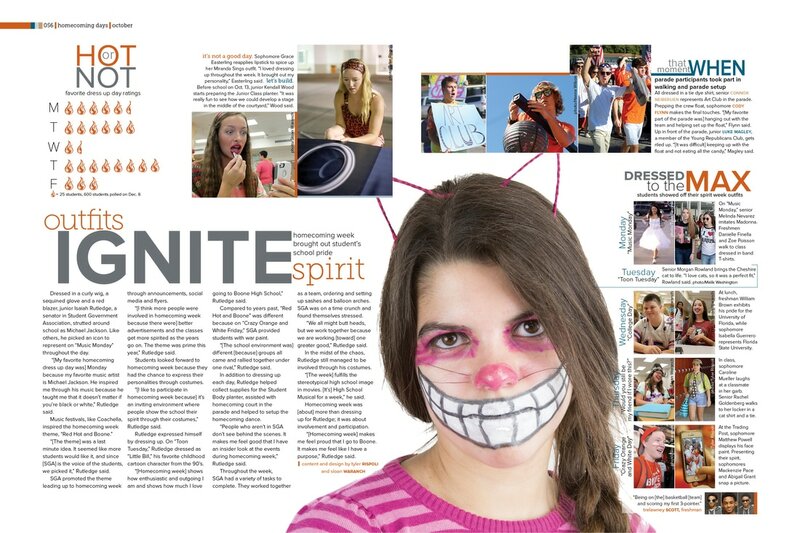 As a first year staffer I am very proud of this design and the direction I took the page. The page ended up winning an award from National Quill and Scroll, which helped me feel validated in my design skills.